The Victoria Heritage Foundation’s Rehabilitation Guidelines are based on the Standards and Guidelines for the Conservation of Historic Places in Canada, a manual of heritage conservation practice. VHF has assembled these guidelines and requirements for its House Grants Program. To ensure that your contractors are familiar with them, you should provide them with a copy of the relevant requirements when obtaining quotes. An overall rehabilitation plan is highly recommended. Ongoing maintenance will minimize the need for extensive repairs. Repairs to the basic structure, foundations and roofs should be done first. Repair of historic materials is preferable to replacement with new work. If original detail is missing or replacement is necessary, new work should accurately match the original forms, materials and detailing, based on sufficient physical or documented evidence. Use products with proven performance records. All surface cleaning should be undertaken with the gentlest method possible. Use contractors who have experience working on heritage houses and positive references you can personally verify. Although owner's labour is not eligible for grant, materials are eligible. When obtaining quotes for a project, make sure you have considered all aspects of the job. Additional costs may not be funded. While every effort is made by the Victoria Heritage Foundation to provide correct information and guidance to homeowners in making applications, neither VHF nor its members or staff individually guarantees the information given. Victoria is in a high-risk earthquake zone. VHF urges homeowners to consider seismic upgrading both for personal safety and protection of their investment in Victoria’s irreplaceable historic housing stock. VHF strongly recommends that homeowners purchase Earthquake Insurance. Although the 2012 Building Code includes prescriptive seismic guidelines for new construction, these are most likely not directly applicable to heritage-type buildings. Seismic upgrading for foundations of heritage-type construction, masonry chimneys and roof structures must be designed by a Professional Engineer in order to be eligible for a grant. Where seismic upgrading is planned, homeowners can expedite the process by obtaining the required engineering design along with the contractors’ quotes, and submit these with the grant application. The cost of the engineering documentation is elegible as an additional grant to that allotted to the construction (see Special Grants in Application Requirements document). VHF funds foundation repair as well as some new foundations. Any foundation that raises the house will be considered on a case-by-case basis. Reconstruction of foundation skirting should replicate the original, including water table elements. VHF funds only exterior brick and masonry work. Make sure your contractor is familiar with historic masonry work. Cleaning or paint removal should be undertaken with the gentlest method possible. Media (e.g. sand) blasting and pressure or power washing are not acceptable. When repointing mortar joints, power tools are not recommended for use on vertical joints and considerable care is required for their use on horizontal joints. Strength, composition, colour, texture and profile of mortar joints or pointing should closely match original. Mortar should be weaker than the bricks. Historic brick construction used soft lime mortars with a minimum of Portland cement. When rebuilding chimney, reuse original bricks or stone wherever possible. Replacement bricks or stone, if required, should closely match original in profile, colour, texture and size. Do not use soot-stained bricks on exterior. Profile and material of chimney cap and chimney pots should closely match original; try to find old photographs. Beware of reproducing a chimney which has been rebuilt incorrectly in previous years. If installing flue liners (not funded by VHF), use minimum projection above chimney. Gutter replacement should be coordinated with re-roofing, and both should precede painting. Fascia boards and rafter tails should be checked for rot, and repairs included in quotes. When repairing or replacing deteriorated woodwork, use like materials (wood species) and ensure that the exact profile of the original material is replicated. Most modern stock lumber has rounded edges and is likely smaller that the original and may not be an acceptable replacement. All new woodwork must be primed (with oil primer) on all sides at time of installation. Do not allow contractors to cut off the exposed or notched rafter tails (typically found on Craftsman houses) to allow installation of larger gutters. Built-in gutters should be repaired and retained rather than attaching new ones. Original materials are preferred (i.e. wood, galvanized metal), but pre-finished enameled steel or aluminium is acceptable if compatible with colour scheme of house. Original profile of gutters (typically ogee or K-style) and downspouts should be replicated. Downspouts in Victoria were typically round (2" or 3" is available). Square downspouts will not be funded unless there is documentary evidence that they were original to the house. VHF funds repairs to historic stucco. VHF also funds removal of stucco, asphalt, asbestos, aluminum or vinyl siding where original siding has been covered by these materials. Ensure that any textured or decorative stucco is accurately recorded before undertaking repairs (i.e. note texture, thickness and colour). Strength, composition, colour and texture of historic stucco should be carefully matched. Consider repairing entire wall panel or section, but generally do not remove sound stucco. When obtaining estimates for roofing, it is important to provide roofers with a copy of these VHF requirements and ensure that they specify the applicable requirements in their written quotes. VHF funds repairs to roofing including flashing. VHF is able to fund re-roofing of a house once every 30 years. VHF will fund re-roofing with historic material as well as compatible substitutes. Substitute roofing material should reflect the historic material in design, colour, exposure, size and other visual qualities. A sample of proposed material, if new to VHF, must be submitted for review and approval. Roofing and gutter replacement should be coordinated (see Fascia, Gutter & Downspout requirements). 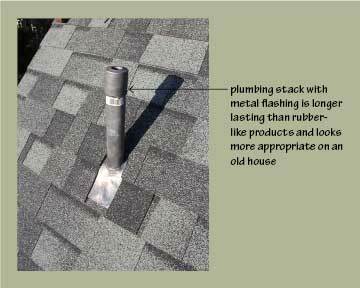 Masonry chimneys require repointing; this should be done prior to re-roofing (see Chimneys & Masonry requirements). Ensure that nail length for roof overhang on exposed eaves is correct to avoid protruding nails. All new elements (including vents) should be fitted as discreetly as possible. Vents must be installed to BC Building Code requirements. Contractor should indicate the number of required vents and discuss placement of the vents. Ensure chemical and physical compatibility between roofing material, fastenings and flashings (i.e. do not use copper with galvanized material). Low-pitched roofs have specific requirements: refer to BC Building Code or specialist. Original ridge capping may have been metal or wood and should be reinstated, if known. If there is documentation of original rooftop decoration or missing features such as cresting or finials, consider replacing at time of re-roofing (see Special Grants in Application Requirements document). All layers of old roofing must be removed prior to application of new roofing material. Photographic verification or VHF inspection is required. Any known problems in roof structure must be repaired prior to re-roofing. Sheathing where required, must be plywood. All old flashing must be replaced with new. 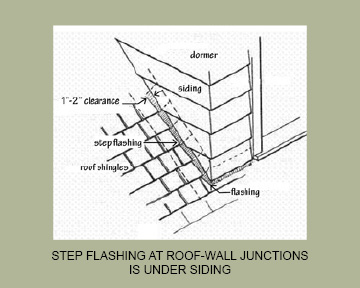 Flashing at roof-wall intersections must be under siding – not surface mounted. This may involve careful trimming or selective replacement of wall cladding. 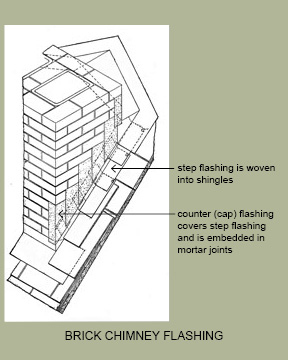 If trimmings is required, there should be approximately 2” clearance between the roof shingles and the wall cladding. Note: VHF will no longer approve grants where the flashing is applied over the siding at roof-wall intersections (e.g. dormers). Learn more about why this is important. Counter flashings on sides of brick chimney should be stepped (rather than continuous) and inserted into mortar joints and re-mortared. Plumbing stack flashing should be lead (rather Neoprene rubber). 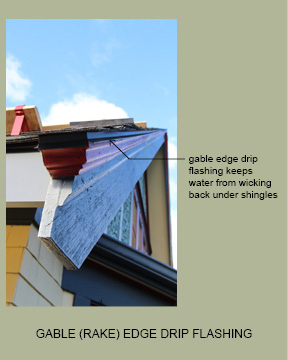 Gable (rake) edge drip flashing must cover plywood sheathing edges. 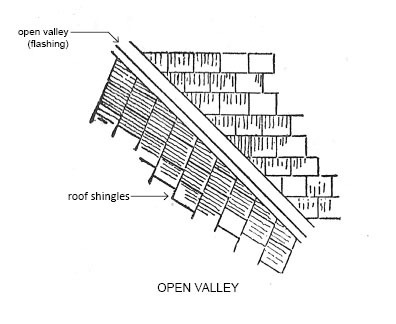 Roof valleys must have open valley shingling with exposed flashing. 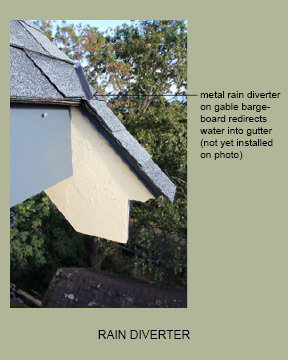 Metal rain diverters must be installed at bottom of gable edges where bargeboards extend beyond roofline. Ridge cap shingles should be high profile if fibreglass laminate shingles are used. Continuous ridge vents or metal (rather than plastic) roof vents are preferable. It is always preferable to repair original material where feasible. Where the design of missing woodwork elements is unknown, documentary evidence must be provided from buildings of a similar style and era to demonstrate that replicated elements will be appropriate. To ensure historical accuracy, it is recommended that homeowners consult widely with those knowledgeable in the field before undertaking the replacement of missing elements (e.g. heritage architects, designers or engineers, City of Victoria Heritage Planners, VHF House Grants Inspectors). Such preparatory consultations can assist the homeowner in avoiding inaccurate design choices as well as the use of inappropriate materials. When repairing or replacing deteriorated woodwork, use like materials (wood species) and ensure that the exact profile of the original material is replicated. Most modern stock lumber has rounded edges and is likely thinner than the original and may not be an acceptable replacement. Rotted or structurally deteriorated woodwork must be repaired or replaced prior to applying paint. All new woodwork must be primed on all sides at time of installation (including concealed areas such as stair treads, etc). Contemporary products suitable for preservation of deteriorated woodwork should be researched for your projects. Composite materials (e.g. plywood, OSB, fibre-cement board) should not be used for exterior cladding without prior VHF approval. Many original porches floors were made with Douglas fir tongue and groove boards and should be replaced with like materials whenever possible..
Stair treads should be bull-nosed; cove moulding under the treads may be historically correct for your house. It is preferable to repair rather than replace original wood sash windows. The key to window longevity is quality of original material and construction techniques, combined with regular maintenance. These general guidelines for historic windows also apply to the repair, restoration and replication of historic doors. VHF funds repair and restoration of historic windows. VHF funds replication of historic windows where the original windows are missing or beyond repair. VHF does not fund double-glazed or thermal units, replacing broken panes, nor freeing painted-shut windows. Replacement windows must replicate the original windows in material, overall frame size, sash profile and size, muntin profile and size, glass colour and reflective qualities. Consider using historic “wavy” glass appropriate to the period of the house be used rather than modern float glass. Muntin bars (the wood pieces dividing small panes of glass) are to be placed between separate pieces of glass, not over one large piece of glass. It is recommended that visible hardware such as hinges, door handles, locks and escutcheons be appropriate to the period and style of the house. Modern weather stripping, door sweeps and deadbolts should be as unobtrusive as possible when viewed from the exterior. Storm windows can increase the life of historic windows by providing protection from the elements as well as heat and sound insulation. VHF funds fixed and opening traditionally-constructed (jointed with through-mortise and tenon joinery) wood storm windows. Storms must be attached with non-invasive hardware. It is recommended that all storm hardware be attached with stainless steel screws. New storms must be primed on all sides and finish-painted before installation. Storms must be painted in gloss or semi-gloss paint the same colour as the exterior face of the sash underneath. For safety reasons, it is recommended that some storms be openable from the interior. Ensure your price quote includes priming, painting, hardware and installation. VHF funded paintwork must be a project of quality. The Victoria Heritage Foundation will be unable to fund any later maintenance painting. Contractors should be reputable, established firms, with business licences, and the ability to stand behind their work. Obtain a written warranty from the contractor. All exterior repairs should be completed before exterior painting: i.e. foundation, roofing, drainage, windows, woodwork and trim repairs. Ensure the highest quality surface preparation and paint for the longevity of the paint job. Proper safety procedures must be adhered to for removing existing paint or surface coatings. Exterior painting is best done between May and September when temperatures are neither too hot nor too cold (between 10°C and 30°C). Wood moisture content should not exceed 12%; use a moisture meter. Exterior painting must commence by September 1st, and be completed before moisture levels are too high and weather becomes unpredictable. The most important aspect of a paint job is preparation of the surface to be painted. An improperly prepared surface will not hold paint. If done correctly the first time, then maintenance will be less frequent and subsequently much easier. Please remember preparation and repairs must be reviewed and inspected by the assigned VHF House Grants Inspector prior to painting or further work that might conceal the repairs. Remove damaged or deteriorated paint before repainting to the next sound layer using the gentlest method possible (hand scraping and hand sanding). No media (e.g. sand) blasting. Power washing is not permitted.. Washing is acceptable only by hand and garden hose. House must dry between washing and painting, to ensure surface will not resist new paint. Wood moisture content should not exceed 12%; use a moisture meter. Ensure a clean surface, free of grease, dirt, mildew, etc. by washing wall surfaces, overhangs, porch ceilings and eavestroughs, inside and out, by hand with environment-friendly cleaners. Rinse thoroughly. Crystalline deposits, which develop under eaves and protected areas, are a major cause of peeling; remove by washing and rinsing as above. Areas of heavy paint build-up, alligatoring, blistering, scaling and peeling, or areas which show a moderate to heavy chalk deposit must be thoroughly prepared to ensure paint adhesion. Remove to a sound substrate by scraping, sanding and wire brushing. No grinding or heavy abrasive sanding that damages wood surface. On rough-sawn textured shingles, previously stained weathered surfaces must be thoroughly cleaned with a stiff fibre brush and a mild, biodegradable remover such as sodium hydroxide, to remove “dead” wood fibres. Glossy surfaces under eaves and protected areas that are not exposed to normal weathering should be dulled by sanding. Where bare wood is exposed, spot prime with a high quality oil-based primer. Loose or warped siding and shingles must be nailed flush with surface using appropriate nails. Fill all crevices, nail holes and cracks. All loose or split caulking on windows and doors is to be removed and replaced. Re-caulk with flexible, paintable caulking, and then prime. Loose and deteriorated window putty must be removed and replaced. Deck surface must be sound, clean, dry and free from dust, oil, grease, rust and scale. Depressions and surface defects must be filled, smoothed and compacted. Sand uneven joints flush and clean. Blisters and peeling areas must be repaired by thorough sanding and priming. Several thin applications of paint are better than one thick coat. Shingle siding should be stained unless already painted. Stains penetrate the wood surface and are less likely to peel. Two coats of top-quality paint should be applied; film thickness as per material specifications. Choice of paint will depend on condition of surface, the existing undercoat, location on house and design of house. Window sashes, doors, frames and trim must be done in gloss or semi-gloss. Old stains in wood will leach through latex paint. Wood must be sealed with an oil-based primer. Half-timbering was likely meant to have a flat finish, to simulate an aged, medieval, rough-hewn look. Original colours are one option; these can be revealed by scraping and feather sanding a small area down to the wood and examining it with a magnifying glass. Grants are available for professional paint analysis. Alternative colour schemes and colour placement must be historically-appropriate for the design, period, style and locale of the house. Refer to Benjamin Moore's Historical True Colours for Western Canada paint palette for typical local colour schemes. Avoid bright hues and too many colours on the building. Paint colours have to work in conjunction with roof colours. For assistance in selecting paint colours, consider employing a colour consultant (see Special Grants in Application Requirements document). Download or print Rehabilitation Guidelines.